“In the cloud” has become an ubiquitous business phrase – but what does it really mean when it comes to quoting in the cloud? 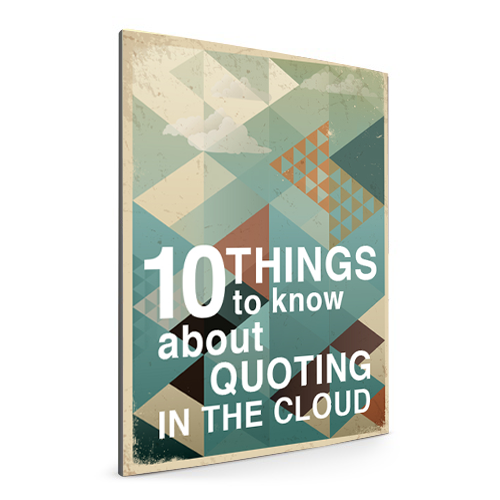 Here are the top 10 things to know about the ways quoting in the cloud makes you more successful. 10. It helps you reduce capital costs. Although “the next big thing” usually carries a big price tag, cloud-based solutions can actually be very reasonable—and even less expensive in the long term. With a cloud solution, there is no need to spend big money on hardware, software, or license fees. Most solutions allow you to avoid those large one-time expenses by offering a flexible, subscription-based cost model. 9. It makes you safer. One of the top concerns of cloud skeptics is the fear of sacrificing data security when allowing company data to exist outside an internal firewall. The good news is that security is actually increased with cloud solutions due to strict International Organization for Standardization (ISO) security standards to which cloud providers must adhere, in addition to the regular security audits. 8. It makes you accessible. Cloud quoting solutions enable users worldwide to access your company product and pricing information from anywhere, at any time without having to download and install anything on their desktops. All your salesperson needs is an Internet connection and he can quote from the office, home, or while he’s face to face with a client. 7. It gets your team in sync. Web style user interfaces that are designed with simplicity and usability allow even the least tech-savvy of users a great, straightforward user experience without a lot of training. 6. It’s fast to get started. Time to value with cloud solutions is significantly lower than with on-premise applications because they’re typically much easier to install than an on-premise solution. Not only is implementation time reduced, but fewer IT resources are required as well. 5. It helps you enjoy the benefits of automation. Moving your quoting to a cloud-based solution allows you to make updates or changes at a global level and know they’re automatically available to everyone using the system. Products and pricing information are always up to date and immediately accessible for quoting. 4. It makes collaboration easy, not cumbersome. Quoting in the cloud makes it easier than ever to replicate approval processes in order to stop errant or incomplete quotes from going out the door follow processes. Salespeople can easily ask others for help or input from within a real-time system rather than relying on email or outdated, decentralized documentation. 3. It makes you insightful. When you are quoting on your own desktop or even within your favorite spreadsheet, you are not able to get the analytics across your enterprise that would allow you to make business decisions based on quoting data and the buying trends of your customer. Most cloud-based solutions run on a platform that will give you real-time access to reports and dashboards that show you exactly what’s happening across all quotes. 2. It keeps you up to date. Software updates and renewals are typically handled by the cloud vendor and occur several times a year at no cost or burden to you. This ensures that the user interface remains modern, up-to-date, and secure. 1. It helps you say goodbye to outdated processes that are slowing you down. Often the biggest barrier to moving to cloud-based quoting solutions is parting ways with the way you have previously done things. The benefits listed above should give you the peace of mind that you can confidently walk away from your old quoting systems and spreadsheets and take advantage of the flexibility, security, and agility the cloud has to offer.